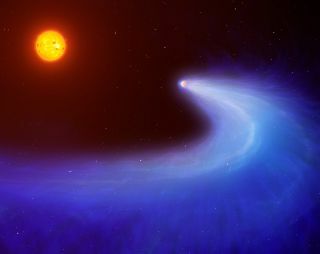 This artist's impression shows exoplanet GJ 436b, which is surrounded by a massive gas cloud that streams behind the planet like a comet's tail for millions of miles. GJ 436b, located about 33 light-years from Earth in the constellation Leo, is a kind of world known as a warm Neptune. Such planets, at about 10 to 20 times the mass of Earth, are about the mass of "cold Neptunes" such as Uranus — and, naturally, Neptune — but they are as close, or closer, to their stars than Mercury is to our sun. With an orbit of only about 3 million miles (4.8 million kilometers), "GJ 436b is 33 times closer to its star than Earth is to the sun, and 13 times closer than Mercury," Ehrenreich told Space.com. The cloud of gas around GJ 436b, made up mostly of hydrogen, has a circular head that surrounds GJ 436b, and a tail trailing behind the planet. The diameter of the head is about 1.8 million miles (3 million km), or five times the width of the host star, which is about half that of the sun, Ehrenreich said. The length of the tail is uncertain, because the research team's observations do not cover it entirely, but their computer models suggest it could be about 9.3 million miles (15 million km) long. The scientists estimated that GJ 436b is currently blowing off up to 1,000 tons of gas per second. This means that GJ 436b is currently losing about 0.1 percent of its atmosphere every billion years, which is far too slow a rate to deplete its atmosphere in the lifetime of its parent red dwarf star. However, when the star was more active in its infancy, the researchers estimated that GJ 436b could have lost 10 percent or more of its atmosphere during its first billion years. Recently, another team of researchers suggested that GJ 436b might possess a helium-rich sky depleted of hydrogen. "However, in order to be really hydrogen-poor and helium-rich, the atmosphere of GJ 436b should have represented a very small fraction of the planet['s] initial mass, around one-thousandth," Ehrenreich said. "In such a case, the whole atmosphere would have been gone today, which as we measure is not the case." Ehrenreich noted that the Kepler spacecraft, as well as NASA's upcoming TESS space mission and the European Space Agency's future CHEOPS and PLATO spacecraft "are poised to find thousands of system like GJ 436 in the coming years." This suggests that many other planets with cometlike tails could soon be discovered. Artist's concept of the exoplanet GJ 436b, which is apparently surrounded by a massive gas cloud that streams behind the planet like a comet's tail for millions of miles. The scientists now plan to investigate less massive planets, such as "super-Earths" and "mini-Neptunes" to see if they might also have puffy atmospheres and cometlike tails. "We're going to study one such object in the course of next year with Hubble, and have proposed to observe several more," Ehrenreich said.